Today we continued onward through bands of yellow and green fields on Hwy 96; the yellow fields were mature or harvested wheat while the green were corn fields. A weather front was passing through so we had a headwind most of the day, but the temperature was cool. 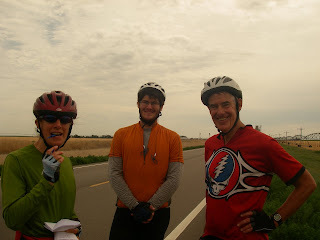 About 12 miles out of Tribune on Hwy 96 we saw some other cyclists headed west. They were Chris and Ben from Sonora, CA and they were going to finish in Santa Cruz, CA. It was one of those "small world" incidents. 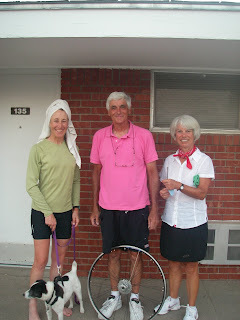 They knew Chuck, our neighbor in Strawberry, and were in fact going to ride over Sonora Pass on their way to Santa Cruz. We exchanged info. 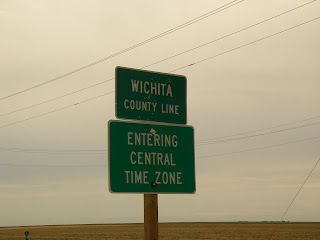 and headed toward Scott City. The rest of the day was uneventful until dinner when we met three other cyclists at the restaurant. A couple from France was at the next table and had ridden from Chicago and were heading to Silverthorne, CO. They had a broken spoke and Dave volunteered some tools and expertise to fix it after dinner. Jacques and Marie-Jo are from Paris and have toured in the U.S. before. They were very grateful for the assistance and offered to help us with any touring in France. Since we are on the main east-west route now, we expect to meet and share adventures with many other tourists on the road. Today we have just passed the 2000 mile mark.